Greetings, traveler! Welcome to Master Inika's Library. I'm Master Inika, dedicated BIONICLE fan and fanfiction writer of nearly a decade. This is the only place on BZPower you'll find all of my BIONICLE comedies, epics, and short stories in one place! (Not counting the horrible ones I wrote back before the Great Dataclysm and am horribly ashamed of, that is.) Just click on a story to start reading! Hunting for the Truth - A story featuring a trusting Toa of Magnetism working to steal incriminating secrets from the sinister Makuta of Stelt, all for a mysterious, alluring benefactor. The Humbled Predator - My entry in the Ambage "Fish!" flash fiction contest. Return to the Underworld: The Protectors' Mission - My entry the Generation 2 writing contest "The Legend Continues." Now and Always - My contribution to the 2017 BZPower Fanfic Exchange, based on parameters from AZBlue. The LEGO Movie: Dangerous Detour (Standalone) - My entry in the Caveat Scriptor contest, the prompt being to write a scene that would fit in The LEGO Movie, which had yet to be released at the time. The Preparations of Mantax (Standalone) - Barraki Mantax is expecting his fellow Barraki to arrive and hear his terms to relinquish the Mask of Life, but first he must get the Razor Whale's Teeth presentable! 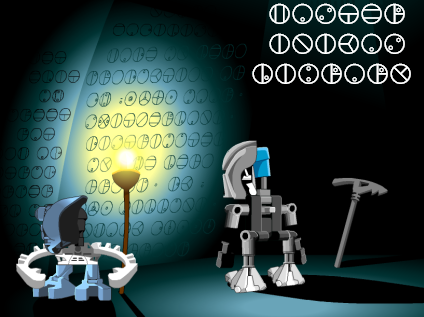 Parody of a scene in BIONICLE Legend #8: Downfall. Kongu's Bad Day (Standalone) - Kongu's day at work goes from bad to worse during the events of BIONICLE 2: Legends of Metru Nui. A Naming Day Noel (Standalone) - My Secret Santa gift for fellow BZPower member Xaeraz, and a parody of Charles Dickens's A Christmas Carol. Tuwhera Hopuoro Po (Standalone) - A Matoran comedian delivers a standup routine to the denizens of Mata Nui. Makuta Maledrin and the Motley Monster He Made (Standalone) - A creative Makuta presents his latest Rahi beast, hoping to impress Miserix with his many deviations from the norms of Rahi creation. ​All We Want is Peace (Standalone) - The Earth Tribe's "peace conference" during the early days of the Core War proves to cause the opposite of its declared intentions. Written in response to the revelation of the Earth Tribe's involvement in the Core War. A Brief Word from Tahu (Standalone) - Tahu gives a quick speech on the state of BIONICLE after the second cancellation. "WOW. Just wow. I am in awe of the quality of your writing. Normally I would give a full, In-depth review, but I cannot find the words. [...] Seriously, this is very well written and has me hooked. I honestly cannot wait to read the next chapter!" - TinkerTech on Ask Tahu! Edited by Master Inika, Jun 22 2018 - 01:34 AM.